Away off in a far corner of the Thompson-Nicola Regional District, in an area shared by the Cariboo Regional District, a small group of citizens – the Lac des Roches Watershed Society – formed an association to provide a united effort to preserve this pristine watershed area. 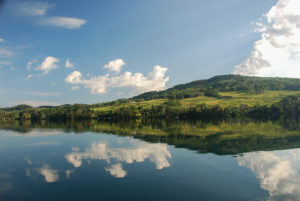 There is no doubt, having seen the beauty of the area viewed from Highway 24 – the Fishing Highway – which snakes along the north shore of Lac des Roches, Lac des Roches lives up to its name as “the most photographed lake in British Columbia”. The Lac des Roches Watershed Society has become a strong lake stewardship group, partnering with many different organizations and individuals in its goal to preserve this area. Realizing some development in the area is both necessary and beneficial, challenges still remain which keep the association active and the mission statement very appropriate. In addition to ongoing lake monitoring, the group would like to see the Official Community Plans for the area modified to include an Educational Conservation Reserve on the sensitive lake shores at the east end of Lac des Roches, the same land previously earmarked for development by the BC Government.